We offer a range of Pressing Machines that are used for pressing a lot of corrugated boards after pasting. This is done to remove air bubbles and to obtain an even board. The machines offered by us are made from the finest quality raw material and are priced competitively. All our products are tested for quality before dispatch. Our comprehensive range of Sheet Pressing Machines is designed for pressing glued corrugated sheets. The international quality range of Sheet Pressing Machine is available in various configurations as specified by our clients. 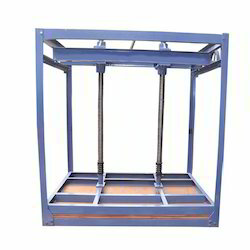 The machine is fully-enclosed and is adjustable by rotating handle provided on one of its side. It helps to provide even shape of the warp sheets, ensures durability and cost effective performance for a longer period of time.